Wyoming is home to thousands of elk. Most of these live in the mountains during the summer, spring and fall . This was not always the case in Wyoming--the elk at one time did live on the plains. As pressure on their habitat increased, they moved into the mountains. 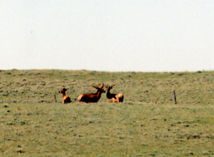 Other states have elk that do still live on the plains. When the snow gets deep, the elk will come down to lower altitudes. In the winter, you will sometimes see large herds out on the plains. Elk are quite large animals. A bull will weigh around 700 lbs, a cow elk around 500 lbs. The bulls can be 5 feet tall at the shoulders, cows over 4 feet. Calves weigh about 35 pounds at birth. They have spots like fawn deer do. Fawns will lay in the sagebrush or tall grass perfectly still. We were fishing in the Big Horns a few years back and I was walking through the trees looking for wildflowers to photograph. I came within six or less inches of stepping on a calf elk. The calf bolted, I screamed. My husband had to tell me where the calf ran off to--I was too startled to notice where it ran. 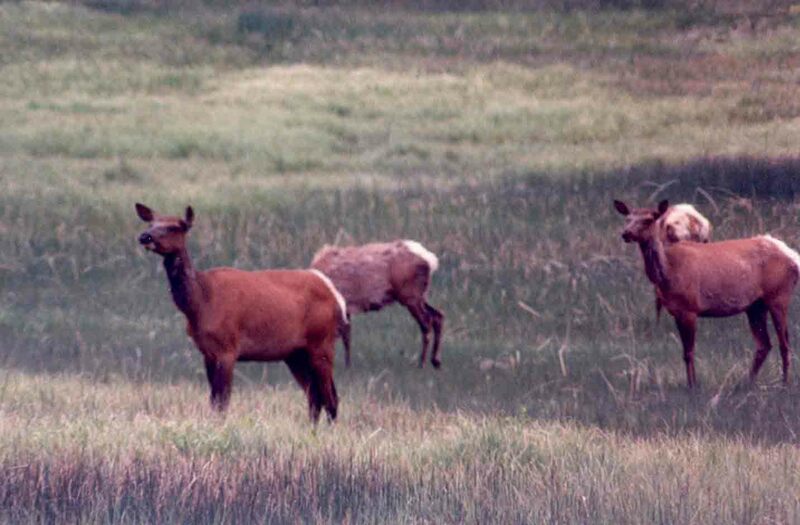 As is the case with mule deer, an elk's color changes with the seasons. In the winter, they are a more gray color. In the spring, the coat takes on a rich brown color. The process in between the two colors looks very scraggly. The color change keeps the elk from standing out against the white snow, plus the coat becomes thicker for winter. 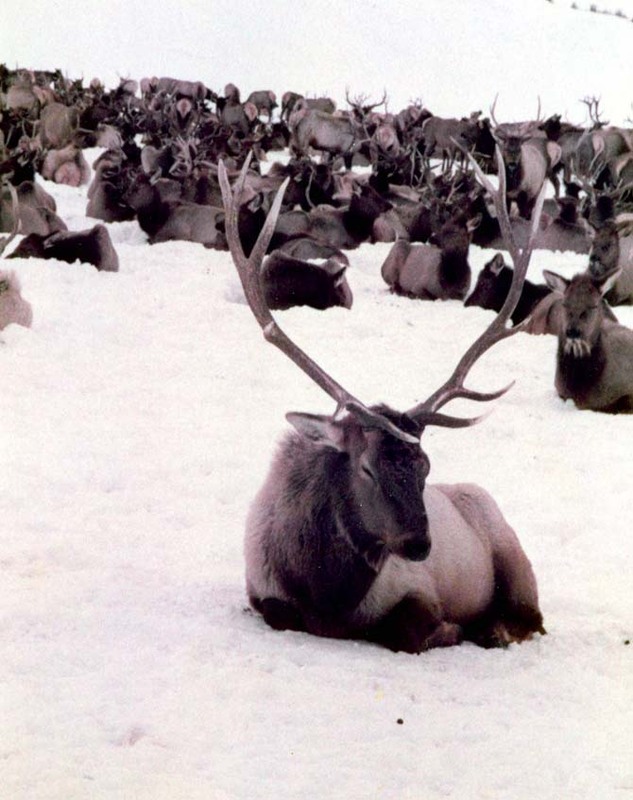 The thicker coat insulates the elk against the bitter cold and wind of winter. Elk "bugle", which is a sound that would seem more appropriate to a bird, not such a huge animal. It's part of their mating ritual. The cows "bark" to signal danger and "mew" to communicate with each other. Calves bleat to signal they are in distress. You can go to the Rocky Mountain Elk Foundation website, click on the Fun Facts page and there is a button to click to hear a recording of these sounds. I would recommend doing this--these are such unique sounds! Elk are mostly grazing animals, eating grasses. In the winter, they may also add some parts of shrubs and trees. During warm or hot weather, the elk bed down during the day in shady areas (forests, thick brush) and feed at night. In cooler weather, the pattern reverses. The elk feed during the daytime and bed down out of the wind at night. In my experience, this has made finding elk to photograph or hunt more difficult. The elk are asleep in warm weather during the day and in winter, there are often snow drifts that prevent getting to where the elk are. In the past two or three years, we have seen more elk out in the open on the prairies, during the summers. The weather is cooler and they are more active during the daytime. In 2004, elk began showing signs of paralysis and then dying near Rawlins, Wyoming. 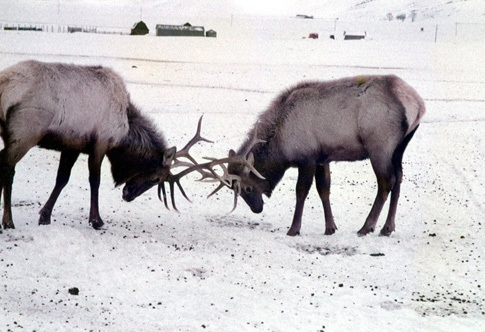 After a considerable study, it was found that a lichen the elk were feeding on appeared to be the cause. It was not clear why this happened. Many of the elk that died had migrated north from Colorado and did not normally feed on this lichen. Plus, the acidic properties of the lichen may have increased that year. This appears to be an isolated incident. Include it to illustrate how populations of elk can be affected by very many things. 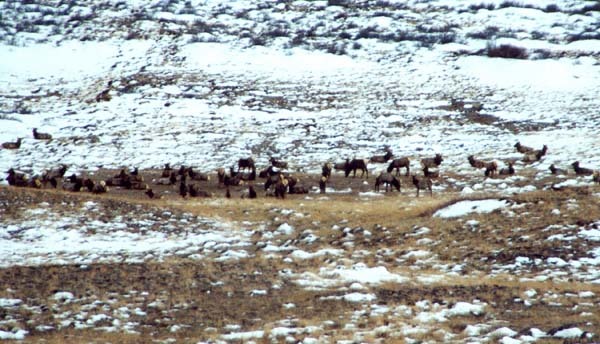 Wyoming has an elk refuge near Jackson where thousand of elk winter over. Shortly after I moved here, my future husband and I went to visit the elk refuge. It was fascinating riding a hay wagon out among the elk. As you can tell by the photos, the elk are not afraid of the wagon (anything that brings hay is okay with them!) and we got quite close to the animals. The Boy Scouts collect antlers from the refuge each year and are allowed to sell these antlers as a fund raiser. No one else is allowed to collect the antlers. It's worth a visit if you are visiting Wyoming in the winter. While the elk refuge was very educational and a great opportunity to see elk up close, there nothing like hearing cow elk in a valley on a mountain "mewing" to one another, which I have experienced. It's awesome! I want to help make sure these sounds can be enjoyed by others in the future, which is why conservation is so important. Much of the information in this "species of the Month" column came from the Rocky Mountain Elk Foundation page. I hope you will check out their sight and learn more about elk and their conservation.